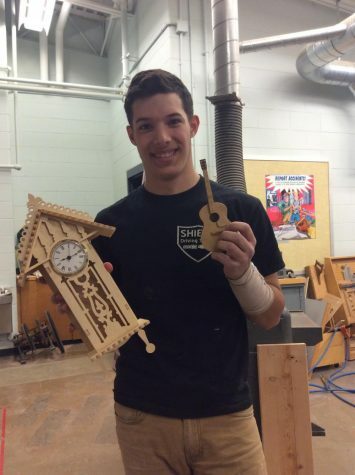 For senior Eric DeBrum, woodworking has been a very big part of his life, and he took advantage of the opportunity to create his Coginchaug Senior Project (CUSP) on the art of scrolling, or using a scroll saw to make something out of wood. 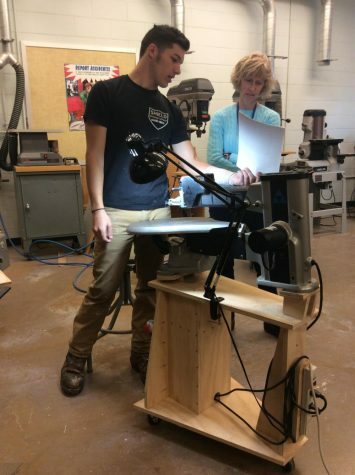 At first, DeBrum wanted to do his project on segmented woodturning, but after realizing it would cost more money than he was hoping for, he chose to switch it to scroll saw work. After two weeks, DeBrum created his first piece, a small wooden musket. Within the next month, he created more pieces, such as a clock, a plaque, and a model guitar. He started his presentation by giving the history and uses of the scroll saw, as well as what he learned and the challenges he overcame. He then did a demonstration of scrolling by starting to create a model plane for his young cousin. Between his pen-making business and scroll saw projects, it will be interesting to see what DeBrum accomplishes in his future, as he starts work at a carpentry union in the fall.